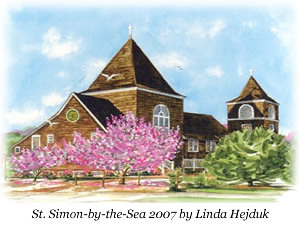 St. Simon-by-the-Sea was built in 1889 as a community church on land donated by Frederick W. Downer, the founder of Mantoloking, a Presbyterian. The church became an Episcopal Church because the first minister was an Episcopalian. It originally had one tower and seated 80 people. It is believed to be a copy of a Norwegian fishermen’s church. 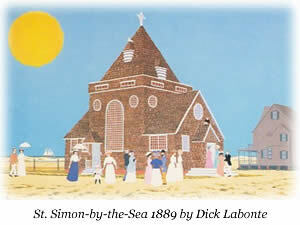 The church was enlarged to its present size, seating 150 people, in 1897. The church is a summer chapel opening mid-June and closing after Labor Day. Various visiting clergy conduct services on Sundays – 8:00 AM Holy Eucharist, 9:30 AM Family Service (Holy Eucharist 1st Sunday of the Month.) Our current annual appeal letter can be found here.